In 11 days, America will be voting for the highest position in the land. It is now down to the two major presidential candidates: Democrat Hillary Clinton and Republican Donald Trump. One is an accomplished and competent politician, with her 30 years of public service; while the other, is a savvy and astute businessman, who also headlined his own reality TV show. “The Fil-Am Vote” presents a comprehensive look into the various arguments and concerns that affect the Filipino American community. This is an important and critical time in the history of elections for the 2.5 million registered Filipino American voters. Thus, starting on October 29 (with a replay on October 30), BA is presenting “The Fil-Am Vote,” an exclusive U.S. election special report that features highly relevant issues, segments and speakers. The 30-minute special includes Campaign Surrogates Meriam Reynosa, member, Filipino Americans for Hillary and California Delegate for Hillary Clinton at the Democratic National Convention, and Herman Martir, AAPI Advisory Council for Donald Trump. Reynosa and Martir sat with BA anchor Gel Santos-Relos to debate the character of the major candidates they are supporting. Also joining the table are accomplished journalists Emil Guillermo, a veteran SF Bay Area journalist and commentator whose work has appeared in NBC, NPR and the San Francisco Chronicle, and Odette Keeley, director of National Media Network Building at New American Media. 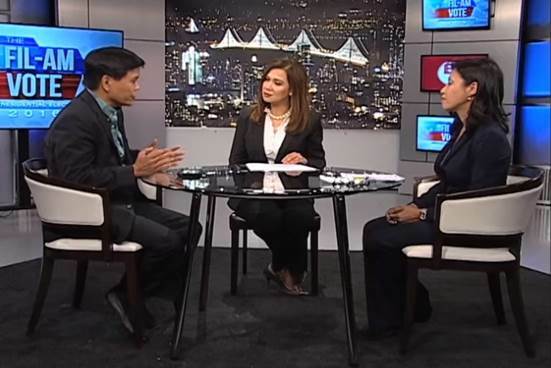 They expound on the visibility of Filipino Americans in the 2016 election campaign. Completing the line-up of subject matter experts is Dr. Robyn Rodriguez, Asian American Studies professor at University of California, Davis, who discusses Fil-Am voting habits and trends. We also gathered a focus group of millennial voters (average age 28 years old) for a candid discussion on the election, the candidates, and the issues they care about. Award-winning print and broadcast journalist Emil Guillermo states that the Filipino American community has grown. He claimed that Filipinos are 16% of the Asian American population and as Asian Americans, Filipinos are six percent of the population in the US. This means that they comprise three percent of the vote. “Our community is growing that is why we are more important or more visible now,” he said. Dr. Robyn Rodriguez, professor of Asian American Studies at University of California Davis, confirms that “party outreach has definitely been a key factor in getting people out to vote. Another thing that is important is the availability of multi-lingual ballots.” These are important items to consider in engaging the Fil-Am community to go out and vote. BA’s “The Fil-Am Vote” shines the spotlight on the issues that matter the most to the Filipino American community. Ranked according to importance, these are: economy (38%), immigration (23%), US-Philippine relations (17%), affordable health care (12%) and national security (10%). The two major candidates, Clinton and Trump, have two very different platforms that could have a large-scale effect on the future of America -- that includes Filipinos living here and even by association, their families in the Philippines. According to Director of National Media Network Building at New American Media Odette Keeley, “We’re the second largest Asian American group in the U.S. Ten of the battleground states have sizable Filipino populations.” Clearly, the Fil-Am vote matters. In a focus group discussion with Fil-Am millennial voters (those between ages 18-34), BA’s Rommel Conclara found out what they are looking for in the next U.S. president. The participants are extremely outspoken about their views and adamantly expressed that they are ready for a change. It would be interesting to hear and note their views on major issues. “The Fil-Am Vote” presents a comprehensive look into the various arguments and concerns that affect the Filipino American community. Included are special reports from BA correspondents Henni Espinosa, Steve Angeles, and Don Tagala. It is an eye-opener and a must-watch in this critical election year where Fil-Am voices could matter more than ever.